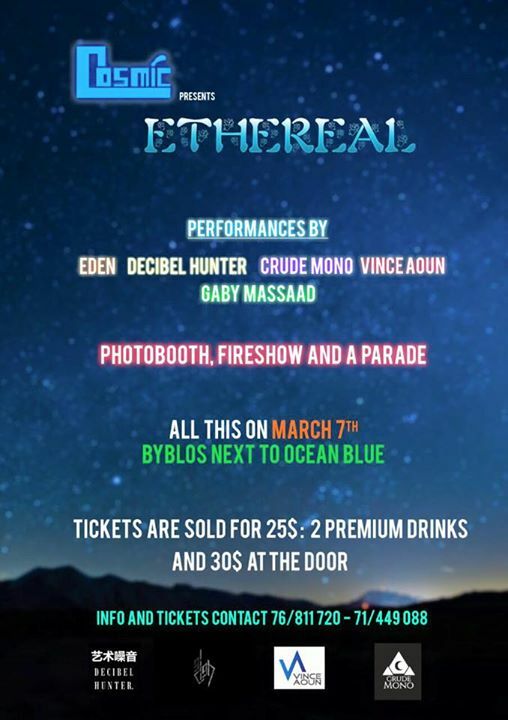 “Ethereal” is the first event organized by Cosmic which is a collective organization. The main goal Cosmic stands by is supporting the local talent, especially the youth. This event will feature 1 oriental parade, 3 band performances and 2 DJs. Cosmic was first established at the beginning of 2015 by Joyce Daccache with the help of many supporters. After being in bands/managing bands for over 3 years, Joyce found it very difficult to sustain an image in the Lebanese music scene especially if you’re a youth band. “When you’re young, nobody takes you seriously thus less concerts, less opportunities, less self-confidence. This is probably why the rock scene in Lebanon is dead, few people support youth bands which leads them to quit and stop playing music… All of that drove me to create Cosmic, so I can support and help the youth in Lebanon, and at the same time expose local talent”, Joyce says about Cosmic.